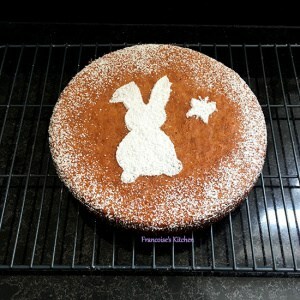 This morning, I suddenly wanted to make a carrot cake, maybe because spring and Easter are in the corner. I remember a recipe that I used to make when I lived in France. From time to time, I talked about this recipe to my husband, but never made it. 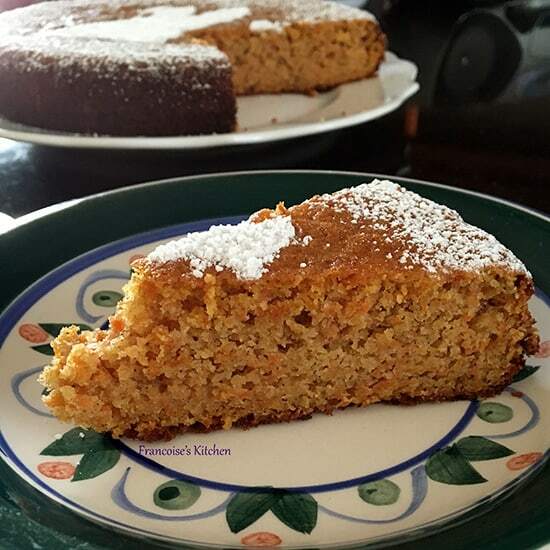 In fact, my carrot cake recipe is not the traditional American carrot cake with the cream cheese frosting. My recipe is plainer and simpler. It comes from an old French magazine. So this morning, I looked for this recipe in my French magazines and found it. I made the cake and my family enjoyed it and asked me to remake it soon. I really like this simple version because the carrot cake is unbelievable moist and fluffy without the addition of butter or oil. I believe this is because there are as many carrots as almonds and just a little wheat flour. The cinnamon and the lemon zest give just the right taste. Spray oil in a cake pan. Line the bottom with parchment paper, spray oil on it, and sprinkle sugar (from the 180g sugar). Put the cake pan in the fridge. Finely grate the carrots. Put them in a bowl with 1 tsp. of sugar (from the 180g of sugar), and mix. Preheat the oven to 360 F.
Beat eggs with a mixer the leftover of sugar until the mix doubled in volume, whiten, and began to foam. With a spatula gently mix the almond flour, the grated carrots and the juice, zest lemon, and cinnamon until blended. Sift the flour and baking powder and add them to the previous mix. 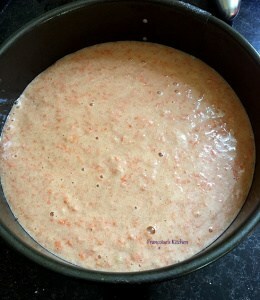 Pour batter into the cake pan. Bake to 40 min or until a wooden pick inserted into the center comes out clean. 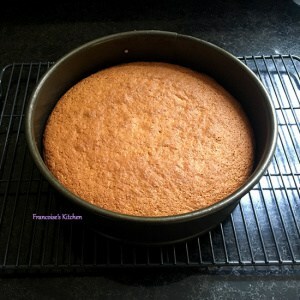 Let the cake cool for 15 min on a wire rack before removing it from the pan. While the cake is still warm, sprinkle powder sugar on the top and if you like, add some toasted sliced almonds.